It took eight seasons of minor-league hockey for Quintin Laing to become a full-time player in the National Hockey League. Eight seasons of long bus rides. Eight seasons of three-games-in-three-night sets. Eight seasons of wondering if he ever would get that elusive call-up. While he doesn't crack the lineup every night, the 28-year-old Laing has been with the Washington Capitals since being recalled from the Hershey Bears of the American Hockey League since Dec. 7, when he was called up for the second time this season. Prior to this season, Laing had just three games of NHL experience, which came with the Chicago Blackhawks during the 2003-04 season. His determination and unselfish demeanor have landed Laing a nomination for the Bill Masterton Memorial Trophy, which is awarded by the Professional Hockey Writers' Association each year to the player "who best exemplifies the qualities of perseverance, sportsmanship and dedication to hockey." "I was pretty caught off-guard by it," Laing told NHL.com. "I'm pretty blown away and humbled by the nomination. To be up for a major award like that, it's really exciting news. Everyone's excited back home." Everyone's excited in the U.S. capital, too. That includes Washington coach Bruce Boudreau, who, much like Laing, finally landed in the NHL earlier this season after spending 17 seasons coaching in the minors. Boudreau replaced Glen Hanlon behind the Capitals' bench Nov. 22, 2007. The coaching change has much to do with Laing's promotion to the NHL, as Boudreau coached the scrappy left wing in Hershey last season and at the beginning of this campaign. Once the Capitals were in the market for a fearless, defensive-minded forward, Boudreau knew Laing was the perfect man for the job. "You need a coach that knows him," said Boudreau. "There's a lot of teams with a lot of players that are in the same boat. I knew he could do a defensive role. But then again, I didn't know how good the NHL was. It's such a higher level than anything both Quint and I had been. But when we got up here and we needed a position filled – and it wasn't an offensive position – I didn't think we had anybody in the system or on our team that could fill it as well as he did. He's fought his way to staying on this team." 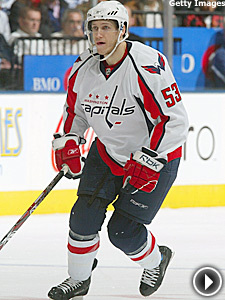 Known more for his ability to block shots, Laing scored his first NHL goal – which proved to be a game-winning tally – against the New Jersey Devils on Dec. 10, 2007, at the Verizon Center. It was a moment he won't soon forget. "That was big," said Laing, who has six points (one goal, five assists) in 39 games this season. "It was unbelievable. To play is one thing, but then to score … it was pretty cool." It certainly made all those years in the minor leagues worthwhile. Laing admitted to NHL.com that he often thought about hanging up the blades as the years went by without a single promotion, especially after he was sent back to the AHL's Norfolk Admirals following his brief call-up to Chicago. "I got called up for three games in '03-04, and then three or four years went by," Laing said. "You start to think maybe it won't happen again and you start thinking about going to Europe. You're getting older and you think the chances are getting a lot slimmer. I thought I wasn't going to get another opportunity, but luckily this year I did." The financial compensation certainly would have been better for Laing overseas, where hundreds of players flock every fall. But Laing knew going to Europe ultimately meant he was giving up on his dream. "I just wanted to keep playing here and be as close to the NHL as possible," Laing said. "The best way to get to the NHL is to play in the AHL. The dream was always there; it was just kind of a distant dream. There was always a glimmer of hope. I was just holding on to that and kept plugging away. I was just hoping for my chance." Once Boudreau got his chance, he provided Laing with one. Boudreau gushed about how Laing's work ethic has rubbed off on his teammates, and how his passion for winning is visible whether he's in the lineup or watching from the press box. "His attitude is stupendous," Boudreau said. "He wants to play every game, but if he doesn't play every game he's the first one asking what he can do. He works so hard in practice. There's a reason why he's up here, and that's because of his attitude. His attention to detail defensively … if he could score like he follows directions, he would be a 50-goal scorer. He's the perfect student. With that dedication, you knew he was going to get a chance." Now that Boudreau and Laing have been given chances, they intend to make the most of them. After a horrid start that cost Hanlon his job, Boudreau has the Caps in the thick of the race for a spot in the Stanley Cup Playoffs. In the final moments of a 5-0 loss to the Chicago Blackhawks last Wednesday, Laing was diving on the ice to block shots. Eight years in the minors will do that to you. "I hope we both stay," Boudreau said. "This is Quint's first real crack at being part of an NHL team. But if he doesn't play tomorrow, he's going to be the first guy cheering everybody on and pushing everybody to be better. When he does get in, you know he's going to be diving and blocking shots. He's a great support system for this club." The same way Boudreau has been and continues to be a support system for Laing when things aren't going the latter's way. The special bond between coach and player makes Laing's nomination extra special for the 53-year-old Boudreau. "When you know somebody for a long time and knowing what he's done for the teams that I've been on, I'm really excited for him," Boudreau said. "Knowing that this is his first real chance in the NHL and to be nominated for something like that is really special. I was almost like a father thinking that I was so proud of him when he got nominated." Those eight years in the minors have done wonders for Laing's approach to the game. While he's confident he's played his last AHL game, he's not about to assume anything. "I think I'm still trying to prove myself every day and every game," Laing said. "I don't think I'm getting comfortable here. I'm still earning my way, but I think I'm on my way to it."